My collaborators and I have received the Doak Award for our review paper on the Numerical computation of nonlinear normal modes in mechanical engineering, Journal of Sound and Vibration, Volume 364, 3 March 2016, Pages 177-206. The concept of nonlinear normal modes (NNMs) plays an important role in the analysis of the dynamic behaviour of nonlinear mechanical structures. The last decade witnessed the development of numerous numerical methods to calculate NNMs. This paper is the first to offer an overview of the developments carried out in this field and to perform a detailed and critical assessment of the different families of methods. The Doak Award was established in 2011 to highlight the most successful paper in the Journal of Sound and Vibration each year. It is given for the paper which has the best combined record of downloads and citations. All papers published in the Journal during the selected review period are eligible. The award is made in the name of Professor Philip E. Doak, the first Editor-in-Chief of the Journal of Sound and Vibration. 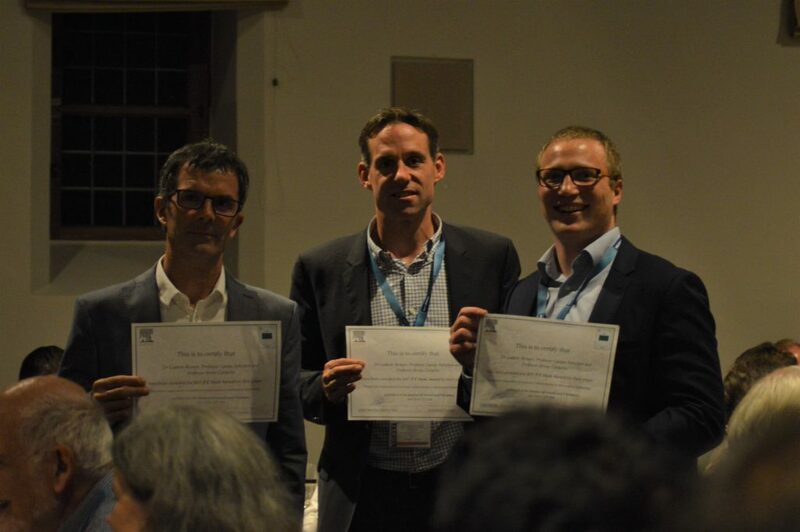 The award was presented at the ISMA conference held this September in Leuven, Belgium. Doak Award received at the ISMA conference, Leuven, Sept. 2017. Left to right: Prof. Bruno Cochelin, Prof. Gaetan Kerschen, Dr Ludovic Renson.